Chytridiomycosis has been linked to dramatic population declines or even extinctions of amphibian species worldwide. Within five months of arriving at El Cope in western Panama, chytridiomychosis extirpated 50 percent of the frog species and 80 percent of individuals. 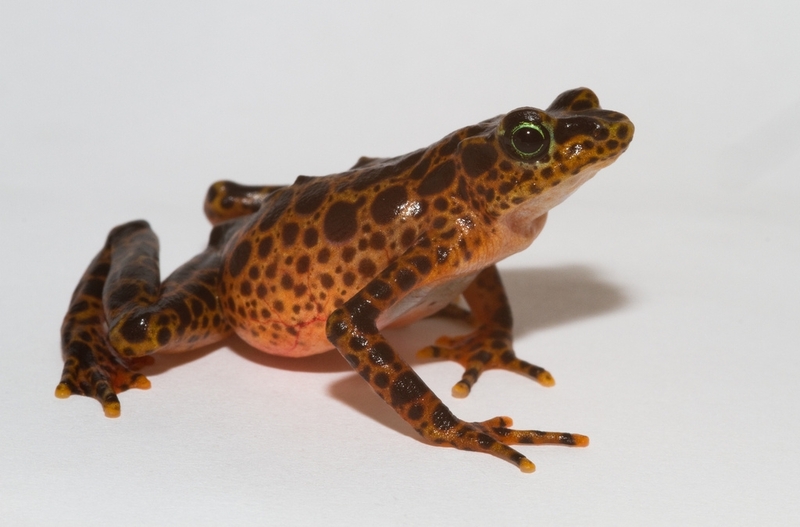 “These animals that we are breeding in captivity will buy us some time as we find a way to control this disease in the wild and mitigate the threat directly,” said Woodhams, who was the lead author of a whitepaper Mitigating Amphibian Disease: strategies to maintain wild populations and control chytridiomycosis. This paper, published in Frontiers in Zoology, systematically reviews disease-control tools from other fields and examines how they might be deployed to fight chytrid in the wild. One particularly exciting lead in the effort to find a cure is that anti-chytrid bacteria living on frog skin may have probiotics properties that protect their amphibian host from chytrid by secreting anti-fungal chemicals. 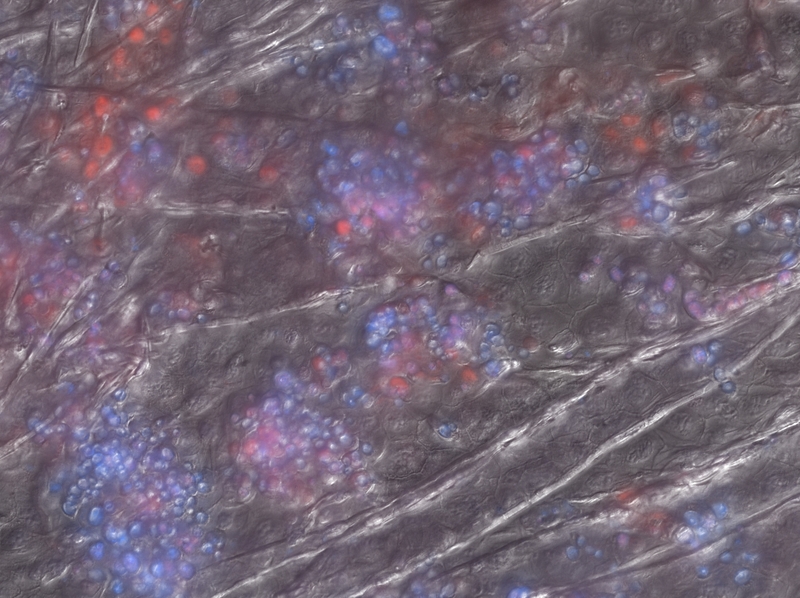 Woodhams recently discovered that some Panamanian species with anti-chytrid skin bacteria transmit beneficial skin chemicals and bacteria to their offspring. The paper, Social Immunity in Amphibians: Evidence for Vertical Transmission of Innate Defenses, was published in Biotropica in May. The Smithsonian Conservation Biology Institute serves as an umbrella for the Smithsonian Institution’s global effort to understand and conserve species and train future generations of conservationists. Headquartered in Front Royal, Va., SCBI facilitates and promotes research programs based at Front Royal, the National Zoo in Washington, D.C., and at field research stations and training sites worldwide. The toughest work week of my life. That’s how I described my Panama trip to colleagues at Defenders of Wildlife, after returning in late June from a week in the field with scientists from the amphibian rescue project. I was documenting their work for an upcoming story in Defenders magazine. I got my first hint of how challenging the assignment would be when I first contacted project director Brian Gratwicke last winter about sending someone along on a rescue expedition. “Send us somebody young and fit!” he said. Youth is overrated, I told myself. I go to the gym regularly and hike, bike and kayak on weekends—so I qualified as fit. But just to be sure, several weeks before the trip I stepped up my workouts to a daily regimen of running and weight training, and lengthened my weekend hiking forays. By the time I left for Panama in late June, I had lost several pounds and could comfortably carry a full backpack for an afternoon in the mountains near my home in Washington, D.C. Plus, this wasn’t my first such trip—on previous assignments I had accompanied field biologists as they tracked wolves in Idaho, wild cats in northern Mexico, and rare salamanders in the Appalachians. How hard could this trip be? The first day in the field began with a 3 a.m. wake-up call in Panama City, packing vehicles in the dark and then driving four-and-a half-hours into the Darien region of southern Panama—a place notorious for drug runners, armed rebels and assorted other outlaws. We were reminded of these hazards frequently, as dour, armed soldiers stopped us at checkpoints to look at our passports, examine our equipment and quiz us about our destination and intentions. By mid-morning, we reached a small port town and then transferred our gear into a motorboat for a two-hour trip to Garachine, a coastal village on the northwestern edge of Darien National Park. In Garachine, we hired native Embera people as guides and porters, distributed most of our gear between them and their horses, and set out in the steamy early afternoon heat up the San Antonio River to our destination—Cerro Sapo, or Toad Mountain. 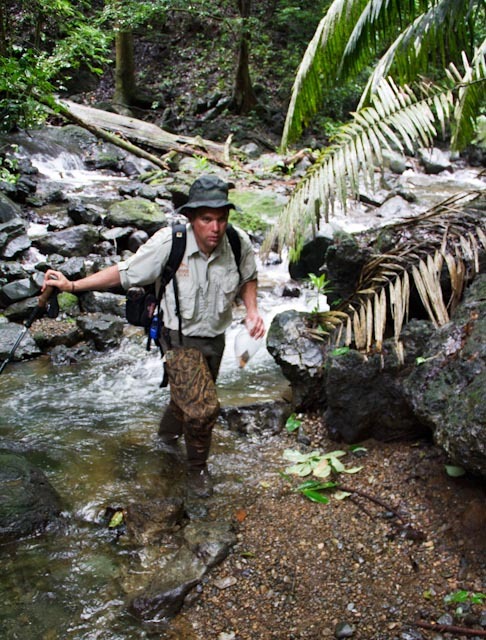 Within an hour of starting our trek, my hiking boots had turned into muddy weights around my ankles—waterlogged from repeated river crossings and slathered in the brown ooze that passes for a trail in this area. Moving uphill into the jungle became harder, but I soldiered on, sweating through my shirt in the heat and humidity. After about five hours of hiking, the trail ended—and the best way upriver was to literally go up the river. Hiking in the water was doable when the San Antonio was shallow and gravelly, but such placid stretches were rare as we moved up the mountain—they were interrupted frequently by slick, algae-covered boulders and stones; narrow, watery ledges next to deep pools; or impassable waterfalls, which had to be circumvented by hacking through trees, vines, palms and other vegetation in the surrounding jungle with machetes. What had been a demanding hike now became dangerous. Even though we all had headlamps or flashlights, they couldn’t illuminate every slippery rock or deep pool or twisted vine. One misstep or slip could mean a badly twisted ankle or bruised limb—or much worse. And the nearest doctor was a six-hour hike back down the river. I gritted my teeth and swallowed my pride, carefully calibrating every step with my hiking pole like an octogenarian with a cane, or, when I didn’t trust my footing, sitting down and sliding over rocks or down muddy embankments on my backside. It couldn’t possibly get worse than this, I reasoned. That’s when we saw the snake. 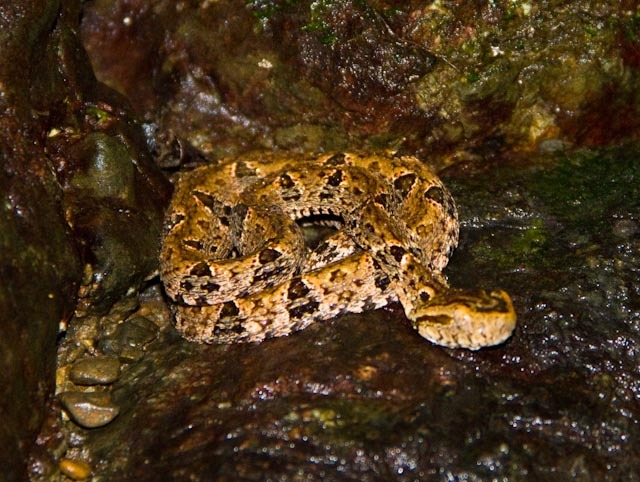 We were making one of our frequent bushwhacking forays around an impassable section of the river when one of our porters stopped suddenly and said “culebra!”—Spanish for ‘snake.’ It wasn’t just any snake that he had nearly stepped on. This yellowish-brown creature in the light of our headlamps was a fer de lance, one of the most dangerous snakes in the world. Edgardo Griffith, one of the biologists on the expedition, carefully moved the viper out of our path and into the darkness with his snake hook—a metal pole with a crook at the tip, around which snakes will instinctively wrap themselves. This particular fer de lance was a juvenile, he said, trying to reassure me. “It probably couldn’t kill you—you’d just lose the leg or arm where it bit you.” I didn’t find much comfort in his words. Finally, after what seemed like an eternity in the dark, we sloshed across a gentle section of the river and climbed about 50 feet up a steep, muddy embankment. There we found a slightly less steep, muddy section of jungle that had been cleared of vegetation and roofed with several blue plastic tarps suspended from nearby trees. This was the Cerro Sapo base camp—our home for the next few days. Someone cooked up a dinner of rice and beans—the first real meal of the day. My stomach was in knots from the stress of the previous eight hours of hiking, but I reasoned that I should eat—and then discovered I could barely open my mouth because I had been clenching my teeth so tightly my jaw muscles had frozen. I pushed a few spoonfuls into my gullet and collapsed in my tent. What had I gotten myself into? Could I survive another four days of this? The short answer is that I did survive. The following days brought many more long difficult hikes upstream, finding and capturing the small, colorful harlequin frogs that were the focus of this rescue expedition. We encountered several more fer de lances along the way, along with whip scorpions and other large spiders, and a wide variety of biting ants, gnats, mosquitoes, midges and flies. One or more of the biting insects attacked my feet, causing them to swell up to twice their normal size, adding a new challenge to the already difficult task of walking. And there was mud everywhere and on everything—on clothes, skin, equipment, dishes, utensils, tents. But none of us got seriously injured or sick. And, despite the challenges we encountered in the jungle, we managed to bring back nearly 80 healthy Toad Mountain harlequin frogs to the rescue facility at Summit Zoo in Panama City. The frogs have proved to be free of the chytrid fungus that is devastating amphibians in so many other parts of Panama—and worldwide. Now begins the long task of breeding these animals and keeping them safe in captivity until a cure for the fungal epidemic is developed. If successful, Toad Mountain harlequin frogs may be spared the fate of the dozens of other species that have succumbed to the chytrid epidemic. So, yes, it was the toughest week in my career—but also one of the most fascinating and rewarding. Mark Cheater is editor of Defenders magazine, the quarterly membership magazine of Defenders of Wildlife. His story on the Cerro Sapo expedition is scheduled to run in the winter issue of the magazine. The Darien conjures up so many different mental images. At nearly 6,000km2 this National Park and World Heritage site represents one of Central America’s largest remaining wilderness areas. It is full of charismatic wildlife like harpy eagles, jaguars and endemic birds such as the beautiful tree-runner and the green-naped tanager. To many travelers, the Darien Gap is a dangerous blank spot on a map, filled with Columbian Rebels who thwart most overland journeys between the two great American continents. To historians, the Darien is the tomb of Scotland’s failed attempt at empire building where in the late 17th century, nearly 3,000 settlers failed to establish a hold for Scotland in the new world. And to many Panamanians, the Darien is a rural heartland for their country, inhabited by the Kuna, and Embera-Wounaan tribes who resisted the settlers. 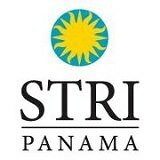 To a herpetologist, the Darien region of Eastern Panama represents one of our last clear chances to conserve neotropical amphibians. This is because an invasive pathogen causing a deadly amphibian disease known as chytridiomycosis has been spreading through the highlands of Central and South America. The only place it hasn’t reached yet is Eastern Panama. The disease devastates amphibian populations without paying any heed to protected area boundaries and it has been implicated in more than 90 amphibian disappearances. One of the hardest hit groups are riotously colorful toads also known as Harlequin frogs. About 30 out of around 113 described species of Harlequin frogs are feared to be extinct, and 60-75 percent of all known species are experiencing rapid population declines. 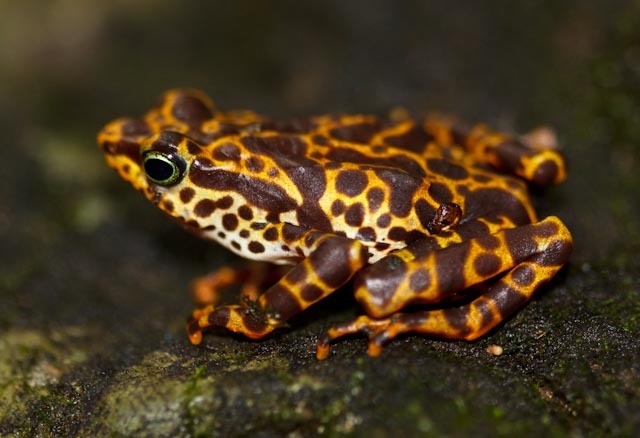 For this reason, the project considers the endemic toad Mountain Harlequin frog, Atelopus certus, as a top rescue priority. Our 4.5-hour drive, 3-hour boat ride and 4 hours by horse, and 2-hour track on foot took us past many huts on stilts, cows, surly faced children and deep into the Darien National Park led by our Embera guide named Alonso. Soldiers prominently displaying AK47s on their hips manned frequent security checkpoints. They stood in front of wanted posters promising $300,000 rewards for information leading to the arrest of pictured FARC rebels, which gave me a clue as to why this area is so poorly explored from a herpetology standpoint. Our operation was divided into two teams. An advance monitoring team headed into the field a week earlier to complete the baseline monitoring of the frog community at upland and lowland sites. Our team followed as an international rescue team of the Panama Amphibian Rescue and Conservation Project’s partners tasked with collecting the frogs. We were also accompanied by a 2-man documentary film crew for Smithsonian Networks and a troupe of Embera porters who safely ferried our ungainly equipment over slippery waterfalls and muddy tracks. On the first day, we immediately found several Atelopus certus males, emitting a low whistling sound from smooth-worn boulders around the rain-swollen mountain stream. Every 10-20m we found an incredulous orange-peel-colored frog with jet-black spots and white belly, vigorously defending his turf from competing males and calling hopefully for females. It turns out that males are much easier to find because they pretty much live by the stream waiting for females year-round. Females, on the other hand, only come down to the streamside when their rosy abdomens are engorged with eggs and they are ready to reproduce. This swiftly became a problem for us, because in order to get captive insurance populations started with good genetic representation of the species, we really needed at least 20 males and 20 females to start us off. On our first day we collected more than 30 males, but just one female, who we found staggering around on a boulder with a smaller, oblivious male clinging onto her back in a mating embrace. Clearly if we wanted more females, we were going to have to cover more ground or to change our strategy. The Toad Mountain Harlequin Frog, Atelopus certus. Female left, male right. The next day, we decided to focus on finding juvenile frogs that had just metamorphosed from tadpoles. The idea is that at least half of them should theoretically be female. Collecting juveniles has an added advantage from an assurance colony perspective, in that we can reliably age them. The problem was figuring out what they look like, and how to separate them from the numerous other dark, 5-mm toad metamorphs hopping around on the damp leaf piles on the stream bank. Edgardo Griffth soon gave us a lesson in juvenile toad identification, pointing out a small dark black frog half the size of your baby fingernail, but closer inspection revealed characteristic features—Atelopus froglets are covered in metallic green chevrons and have bright orange feet! In all, we managed to find 50 males, 12 adult females and about 16 juveniles, from two sites. We ignored the vast majority of calling males, leaving them to continue their daily routines on Toad Mountain. Overall this was a very successful expedition compared to our attempts last year. In November 2009, we hoped to get ahead of the spreading disease wave in the Chagres watershed and targeted Atelopus limosus and Hyloscirtus colymba. When we arrived, however, we discovered that the site was at the peak of a massive disease outbreak. Frogs were difficult to find and 70 percent of all species were infected with chytridiomycosis. We lost many frogs despite having two veterinarians on board to give them daily anti-fungal treatments, and it was deeply upsetting to be thrust into the midst of such a harsh triage situation. Given this perspective, it was a real privilege for us all to witness a healthy, pre-decline population of Atelopus. Our pro-active approach to get ahead of the disease wave made finding the animals and getting them situated in captive conditions much easier, with no mortalities in the first week. We gratefully acknowledge funding for this expedition from the US Fish and Wildlife Service, Wildlife Without Borders Program, and by the Mohamed bin Zayed Species Conservation Fund.